Have you been tired of installing big software that takes most of your time understanding – How it works ? And consumes almost a 1 GB of space that you do not want to waste ? Well, I would like to recommend you one amazing software that I adopted using from last year that is ultimate solution for media burning solution. No matter whether it is CD/DV/ HD Media or Blu Ray Disks. 1. It’s set up size is only 5.26 MB. So compared to the traditional CD/DVD burning software like Nero, ImgBurn takes a very less space on your disk that you can use. 2. And highly simple interface that any newbie can understand. The interface contains only some quick icons that you ever expect from an image burning software. 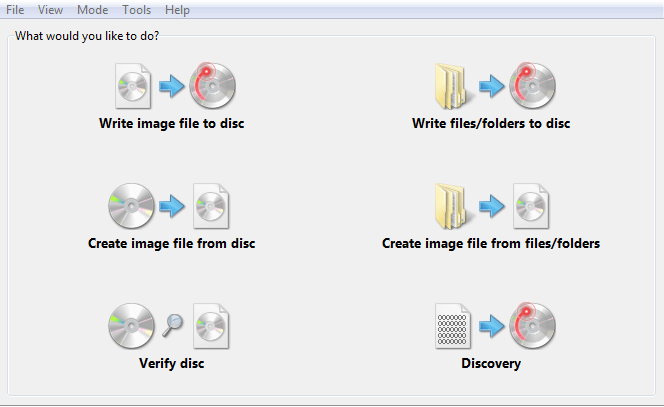 You just have to click on the different Icons according to your needs for burning Image to CD or DVD. Now, How simple any software can be. But apart from its simplicity ImgBurn 2.55 also have advanced features that lets you customize your Media Burning Options for advanced control over the process. Following are the prime Modes that you can operate for burning CD/DVD/HD/ Blu Ray media easily. Discovery – Put your drive / media to the test! Used in combination with DVDInfoPro, you can check the quality of the burns your drive is producing. Norton Internet Security 2012 Hands On Review – Protection With Performance!